"How long will my kitchen project take? ", "What is the best countertop material?" and even "Can Showcase provide a kitchen that meets kosher food prep standards?" are all questions that you may encounter before, during and even after your project. Many of these questions regarding the kitchen industry, as well as what Showcase specifically can do for you, are answered on our design tips page on our website. Of course, if you can't find the solution to your problem, our Long Island kitchen design team is always available to answer any of your questions whether it be over the phone or at one of our two showroom locations. Can showcase kitchens design a kosher kitchen? In the 85 years we’ve been in business, we’ve designed many, many kitchens meeting Jewish food prep and storage requirements. We are familiar with which appliances have “Sabbath settings” and which appropriately segment meat and dairy (in many cases we purchase side-by-side units) and we are adept in designing cabinets to satisfy these requirements. What if I am already working with an interior designer, would showcase kitchens work with an outside designer? Absolutely. We love partnering with all the professional trades. 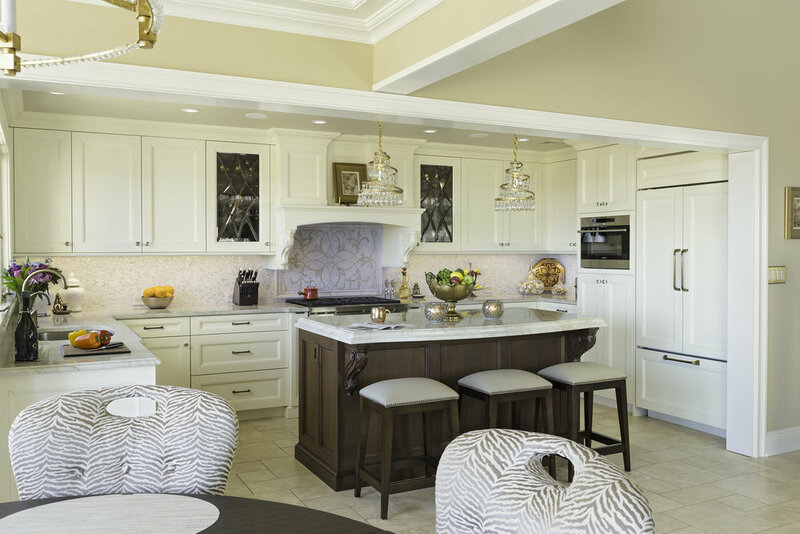 When working with an interior designer, architect or contractor, we confine our input to elements involved in implementing a professional, long-lasting kitchen. How should i clean my new cabinets to keep them looking good for years? Mild soap and water is the best and what we recommend. Chemical cleaners can strip the finishes and never, never use anything abrasive. How long will it take to have a new kitchen? There are many factors contributing to the duration of a project. Scope of the renovation: is plumbing being moved, flooring being ripped out, electrical rewiring necessary, etc. How quickly the homeowner is able to make decisions is primary. As far as the production of the cabinetry, the offerings can vary as much as their lead times. For example, our efficiently-made semi-custom lines can turn around in about 6 to 8 weeks. Whereas our custom, hand-carved cabinetry sources can take 10 to 12 weeks to produce. Lead times are always subject to demand, so always check with our designers to confirm current production schedules. What’s the best countertop surface? There are a few questions we should keep in mind when selecting the ideal countertop. What design concept will be chosen for the space? How practical is the material and what maintenance will it require? Natural stones conveys sophistication for traditional or transitional homes. Natural stones such as granite, marble and quartzite require sealing in order to protect their porous surface. Manmade materials like Quartz sold via such trade names, Pental Quartz, Cesarstone or Silestone need very little to no maintenance and can be scratch resistant. Quartz gives continuity and predictable patterns. It makes a great selection for today’s family homes. What’s the most important thing when designing a kitchen? Functionality, and layout. If you are left-handed, cabinet layout, door openings and position of major appliances needs to be considered. Size of daily dishes, flatware, pots & pans, etc. Some items are oversized and must be accounted for when designing storage. Flow of the space; how large is the family? Are there children that will be spending time in the kitchen? Entertaining? And…cleaning areas vs. cooking areas.